Eggplant Dip recipe by SumeraNawed at DesiRecipes.com. 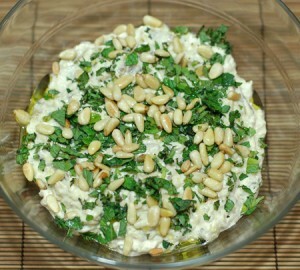 This mouth watering eggplant dip is very simple to make but very flavorful. Eggplant 2 medium dark purple variety. Mint and corriander leaves a handful. Bake the eggplants for 30 min or until they become fully cooked from inside. Put them in cold water so that their skin come off. Cut them into small chunks. Meanwhile grind garlic , green chillies, mint and corriander leaves, tamarand pulp and salt . Add cooled eggplant and run the mixer again for just 1-2 rounds(2-3 seconds only). If the dip is less tangy, add more tamarind pulp, if less spicy, add some red chili powder etc. It tastes great with parathas.